Some of the milestones of the year include finally reaching 100 posts, having 40+ people sign on as followers, and getting 60,000+ visits to the blog. Anyway, as typical of how I pursue this hobby, this post isn't particularly cohesive, and is just a bunch of random stuff that I've been working on. Hopefully though, it will be able to give people ideas for things they would like to do for their own projects. To start out, I want to report that I've completed magnetizing the heads for my SLM skeletal war mammoth. Originally I wanted to have swappable heads for the mammoth and skeletal construct, but the small magnet I mounted in the cervical vertebrae of the construct proved to be too weak to support the metal head. The head is so heavy, that now that it's glued in place, the construct cannot stand up without falling over (a bit of UHU tac is keeping the miniature upright). From undead mammoths, we now proceed to undead dragons. 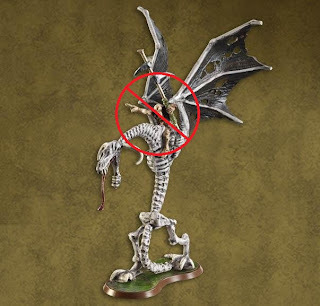 After searching for a nice, cheap option for an undead dragon, I came upon the Heroscape Su-Bak-Na miniature (Orm's Return expansion). Su-Bak-Na is actually the rider of the unnamed skeletal dragon, but I chopped him off, and gave him the heave-ho. The miniature is quite toy-like, with the claws and pelvic area in particular need of improvement. Su-Bak-Na's legs were cut away, a little carving was done, and some kneadatite vertebral spines were added. The claws were given more definition with a soldering iron hot knife, and I stuck some heated needles into the miniature to serve as anchor points for new pelvic bones created from plastic sprue (modeled loosely after T-rex). Now the dragon serves as a mount for Maleficent. 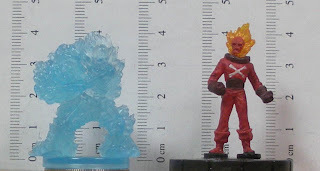 A couple of recent purchases were a Blazing Skeleton from the Castle Ravenloft Board Game, and a HeroClix Blazing Skull (Avengers Marvel #018). I was interested in these miniatures because I wanted to have some translucent flaming skulls as spell effects. 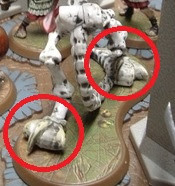 Both miniatures were decapitated, and the skulls were mounted on clear plastic sprue. The flaming skulls are shown below with a DDM Flameskull (War Drums #29). I don't know much about the Flameskull, other than it is a 2nd ed. monster. I added a little dilute blue paint to the Blazing Skeleton skull so that the details would be a bit more visible, and used acetone to remove the paint from Blazing Skull's skull. Last is an ahu that I'm building from Styrofoam and cardboard. The ahu is a ceremonial platform that was used by the Rapanui on Easter Island. The pieces were glued together with Hold the Foam! Moai from the Twilight Creations Easter Island game were then placed in the triangular slots. I'm still trying to decide whether to use Styrofoam, plastic, or cardboard for the ramp of the platform. In closing, I want to thank all my readers again, and wish you all a Happy New Year!